This past weekend, I was hit with a mild case of the plague. Consequently, I've been more inclined to look pitiful while watching Veronica Mars than return to my sewing table. Now that I'm starting to feel like a normal person again, it's time to get back on track. Instead of sewing my final planned garment of the Colette Spring Palette Challenge, I'm opting for one of my bonus projects - the Colette Chantilly dress. For the fabric, I've chosen a lovely blue & white floral cotton from Gorgeous Fabrics. It's actually the same fabric I used for the Sencha blouse, only in a different palette. I have a bit of a thing for small floral prints and this fabric has the added bonus of a lovely drape. It should work really well with all the flowing gathers of this pattern. 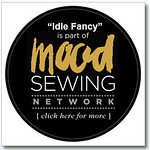 Have you sewn up a Colette Chantilly dress yet? Do you have any suggestions for someone about to dive into the pattern for the first time? Oh, I'm so, so glad you loved Emma! Wasn't it just wonderful? You're right - Romola Garai was definitely a bit nicer than the true Emma. She's just too cute and likable to pull off the true Emma snobbery, I feel. I haven't sewn any Colette patterns yet. I think they're very pretty, for the most part, especially the newer lingerie patterns, but I can't really afford them. Colette patterns are awesome! I recently finished my first Crêpe dress and it's wonderful. I'd love to see your Chantilly version! Oh how lovely! I haven't made this pattern either but I remember Patty over at the snug bug did at the start of the year. Looking forward to seeing it! 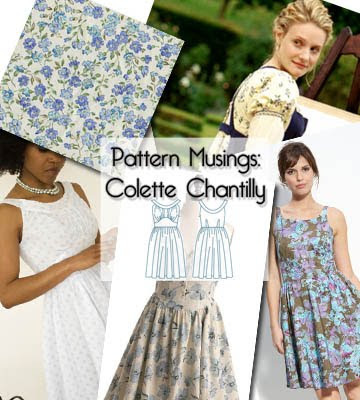 That is the one thing that bothers me about Colette patterns. The designs are lovely, but the pattern prices are truly dreadful. Realistically, I know that it's an effect of being an independent designer, but it's still hell on a medical student budget. 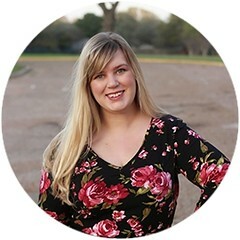 It's totally understandable not to have tried one out, especially when the Big 4 companies have so many patterns that are equally swoon-worthy. And thank you! I'm stocked up on hot tea and lemon, which seems to have worked wonders. Aren't they great? Every design is interesting, but easy to wear. And speaking of the Crepe pattern, I just have to say - yours is my absolute favorite version of that dress. The red polka-dots you chose are so classic and cute! I absolutely loved it! I do hope it turns out as lovely in real life, as it I'm picturing it in my head. This fabric is just gorgeous in person and it was calling for a special pattern. Oh, and I hadn't seen that Patty made a version of this! I'm going to have to track that post down for inspiration - she makes such lovely clothes. Excercise Pretty: Can It Be Done?